In his essay on “Eating American,” the anthropologist Sidney Mintz relates a class conversation during which he admitted that he “did not think that there is such a thing as an American cuisine.” Around this time of year, it’s impossible to ignore the influx of commercials, ads, and general hullabaloo pushing “American food” for the Fourth of July. I have to admit that I’ve been convinced by Mintz’s point for a long time, especially as that assertion pertains to the world of early American cuisine. I first encountered these definitional problems while writing my undergraduate thesis, (over-)ambitiously titled “A Brief Treatise on the Culinary Nature of America During the Time of the Early Republic. In Which the Author Examines Pumpkins, Puddings, Poems, and People. Calculated to Give the Reader a Better Knowledge of American Food and Foodways, and an Easier Understanding of the American Character.” Needless to say, I was a bit keen on imitating early modern cookbook titles back in the day, but the title betrays more than my need to come up with tongue-in-cheek titles (“Roll, Jelly, Roll” and “Peace Came in the Form of a Cookie” were the fake titles of my dissertation for quite some time): it demonstrates how even though I’d written a long paper about food in the late eighteenth and early nineteenth centuries, I still wasn’t sure what that cuisine offered as a cohesive whole. I remain persuaded that there’s no such thing as American food for a few reasons that have to do with eliminating items, British influences, and the problem of omission. First off, I’d argue that there’s no such thing as American food because it’s easier to say what it isn’t than to try to define what it is. Hamburgers? Roots in Germany. 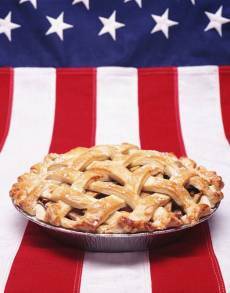 As American as apple pie? Check out those British influences. Peanut butter and jelly? Let’s talk about South American origins of the peanut and its transplantation to Africa before coming back to rest in the British North American colonies. The act of defining an American cuisine becomes problematically reducible to quibbling over what gets included and what gets left out. And indeed, food in the United States during the Early Republic closely resembles the food that Britons consumed. Americans may have grown enamored of corn (as evidenced by Benjamin Henry Latrobe’s decision to placing corn cobs on the U.S. capitol building, Noah Webster’s incorporation of words like “Cornblades,” “Cornchandler,” “Cornmaster,” and “Cornstalk” into his Compendious Dictionary of the English Language, and Joel Barlow’s mock epic poem about hasty pudding), and the first American cookbook author, Amelia Simmons, might have included recipes for Independence Cake, Election Cake, and Federal Pan Cake in her 1796 American Cookery—but these instances built on established British culinary traditions. Recipes simply substituted corn for wheat, as if by appropriating that grain of “ready-powder’d maize,” first grown by a “lovely squaw, in days of yore,/(Ere great Columbus sought thy native shore),” white Americans could claim these recipes as entirely their own. Which brings me to my third problem with the term “American food”: we face an issue when trying to argue for a cohesive cuisine that doesn’t nod to the influence of the many peoples involved in creating it. As is clear from Barlowe’s poem, Americans acknowledged the Native influences in their recently-imagined-but-actually-traditional cuisine. But they could do so in part because portions of Indian removal were already underway. Other foodstuffs beyond corn become challenging when we consider the ways in which consumers elided the Native, enslaved, and free black labor responsible for producing one-pot dishes like hotpots, fried chicken, and barbecue. This particular point will seem obvious to people following the Paula Deen news (for the curious: food historian Michael Twitty has offered a very thoughtful response to the story). But regardless of where you stand on that particular issue I think that it’s important to point out that regional foods have been and can be divisive, and what people think of as “American” in one part of the country doesn’t qualify in other geographic areas—this old NYT infographic about the foods we eat during Thanksgiving is particularly helpful. At the end of the day I wanted to get out my reasons for why I’m willing to assert that there’s no such thing as an American food—but I also want to suggest that there are better questions to ask–just as there are better questions to ask than those regarding authenticity, as food historian Rachel Laudan has asserted–that might more profitably advance the fields of history and food studies. Even if readers don’t accept the claim that there’s no such thing as an American food, I want to suggest that it’s more helpful to ask why people at the time cared so much about defining it, and what that says about them and that time period. And although I wouldn’t agree to the existence of an American food, I would acknowledge the existence of American foodways. So bear with me for a minute as I provide a definition. Foodways comprise anything related to the production, distribution, or consumption of food; in other words, they describe how we eat rather than what we eat. And European travelers to America in the first half of the nineteenth century presented a very clear summary of American foodways. In short, observers complained that Americans ate their food quickly, rudely, and in excessively large quantities. Sound familiar? In the 1820s Margaret Hunter Hall decried the fact that “one and all, male and female, eat invariably and indefatigably with their knives,” thus challenging a recent article dating the implementation of fork usage to the Revolution itself. (Some Americans owned forks, but they tended to use them as serving implements rather than as tools for eating). “It goes rather against one’s feelings,” Hall continued, “to see a prettily dressed, nice-looking, young woman ladling rice pudding into her mouth with the point of a great knife, and yesterday to my great horror I saw a nursery maid feeding an infant of seventeen months in the same way. I must own the woman deserved credit for her dexterity in not cutting the child’s mouth.” In his Notes on the State of Virginia Thomas Jefferson took great pride in describing the fact that animals raised in America were larger than those reared in England: “of 26 quadrupeds common to both countries, 7 are said to be larger in America, 7 of equal size, and 12 not sufficiently examined.” Such animals, by inference, would produce more meat for American tables. Abundance was one thing, but many Americans reveled in the idea of excess. Amelia Simmons’s recipe for Independence Cake, for example, required twenty pounds of flour, fifteen pounds of sugar, ten pounds of butter, and four dozen eggs. Add that to your menu for tomorrow, if you dare. Observers of American eaters may not have agreed on the composition of the American diet, but they concurred about the ways in which Americans ate. Whether consuming meat, fish, fowl, or grain, Americans seemed to eat a lot of it, in part because the legacy of independence (including the appropriation of Native American territory) meant greater access to land. And as we look forward to the debauchery of the Fourth of July—the burgers, and pies, and more than a wee bit of beer—it’s important to acknowledge those early American roots of excess. Sidney Mintz, “Eating American,” in Carole M. Counihan, ed., Food in the USA: A Reader (New York and London: Routledge, 2002), 23. For background on different foods, one could do worse than to start with Andrew F. Smith, ed., The Oxford Encyclopedia of Food and Drink in America (New York: Oxford University Press, 2004), 2 vols. Anita Vickers, The New Nation (Westport, CT: Greenwood Press, 2002), 121. Harvey A. Levenstein, Revolution at the Table: The Transformation of the American Diet (New York: Oxford University Press, 1988), 3. Mark McWilliams,“Distant Tables: Food and the Novel in Early America.” Early American Literature, Vol. 38, No. 3 (2003): 365. Noah Webster, A Compendious Dictionary of the English Language: A facsimile of the first (1806) edition (New York: Bounty Books, 1970), 67-68; Joel Barlow, The hasty-pudding: a poem, in three cantos. Written at Chambery, in Savoy, January, 1793 (New Haven: Printed by T. and S. Green, for Tiebout and O’Brien?, 1796), Evans Digital Collection 30022; Amelia Simmons, American Cookery: Or, the Art of Dressing Viands, Fish, Poultry and Vegetables, and the Best Modes of Making Puff-Pastes, Pies, Tarts, Puddings, Custards and Preserves, and All Kinds of Cakes, From the Imperial Plumb to Plain Cake. Adapted to This Country, and All Grades of Life, ed. Karen Hess (Bedford, MA: Applewood Books, 1996 ), 43-44. Barlow, “The Hasty Pudding,” canto I, p. 90, 88. See, for example, Andrew Warnes, Save Barbecue: Race, Culture, and the Invention of America’s First Food (Athens: University of Georgia Press, 2008). For works that consider the period beyond the purview of this blog and the problem of incorporating immigrant foods—including the point that just because people ate immigrant foods, it didn’t mean they welcomed immigrants into America—see Donna R. Gabaccia, We Are What We Eat: Ethnic Food and the Making of Americans (Cambridge, MA: Harvard University Press, 1998); Hasia Diner, Hungering for America: Italian, Irish, and Jewish Foodways in the Age of Migration (Cambridge, MA: Harvard University Press, 2001). The earliest citation of the term appears in the Oxford English Dictionary in 1941, as “The traditional customs or habits of a group of people concerning food and eating.” In a Ph.D. dissertation, Jay Allan Anderson traced the term to an earlier 1948 dissertation by John Honigmann (itself published in 1968), Foodways in a Muskeg Community. By contrast, Lucy Long, in an entry in The Oxford Encyclopedia of Food and Drink in America, claims that folklorist Don Yoder coined the term much later, in 1970. Yoder described foodways as “The total cookery complex, including attitudes, taboos, and meal systems—the whole range of cookery and food habits in a society.” Regardless of when the term was invented, the definition is adequate. Oxford English Dictionary Online, search under “Foodway, n.,” especially def. 2, http://oed.com; Jay Allan Anderson, “A Solid Sufficiency: An Ethnography of Yeoman Foodways in Stuart England” (Ph.D. diss., U. of Pennsylvania, 1971), xl; John Honigmann, Foodways in a Muskeg Community (Ottawa: Distributed by Northern Co-ordination and Research Centre, Dept. of Northern Affairs and National Resources, 1961); Lucy Long, “Myths and Folklore,” in Smith, The Oxford Encyclopedia of Food and Drink in America, vol. 1, 134. Margaret Hunter Hall, The Aristocratic Journey; Being the Outspoken Letters of Mrs. Basil Hall Written during a Fourteen Months’ Sojourn in America 1827-1828, ed. Una Pope-Hennessy (New York: G.P. Putnam’s Sons, 1931), 35-36. Thomas Jefferson, Notes on the State of Virginia, ed. William Peden (Chapel Hill, NC: Published for the Institute of Early American History and Culture at Williamsburg, Virginia by the University of North Carolina Press, 1955 ), 55. Edouard Montulé, Travels in America, 1816-1817, translated and edited by Edward D. Seeber (Bloomington, Indiana: Indiana University Publications, 1950 ), letter III, p. 24; Thomas Hamilton, Men and Manners in America (Philadelphia: Carey, Lea & Blanchard, 1833), 21, 30; Frances Trollope, Domestic Manners of the Americans, ed. John Lauritz Larson (St. James, New York: Brandywine Press, 1993 ), 8; Hall, The Aristocratic Journey, 37. Really great post! Thanks for the citations as well! Most of your points about borrowings and regional variation can be made about all national cuisines– though admittedly some (e.g. Chinese) did some of their most significant borrowing thousands of years ago. The South American origins of the peanut is not by itself a meaningful argument against calling the P, B, & J sandwich “American” cuisine. Whether we would WANT to claim it is, of course, a separate matter.